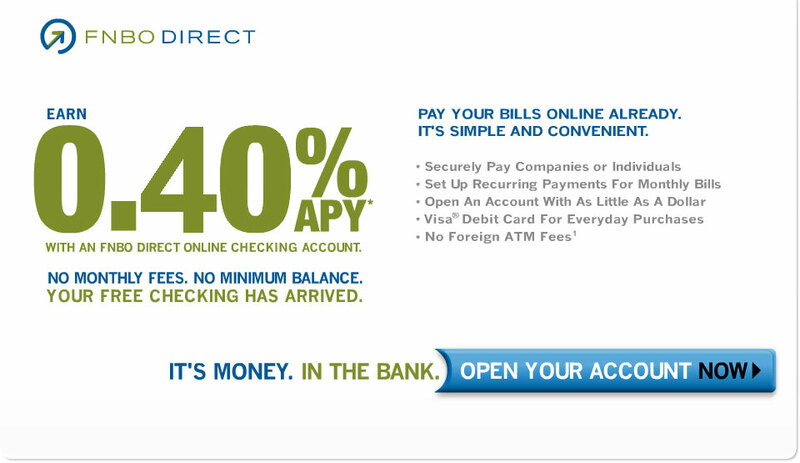 *FNBO Direct Online Checking Account Annual Percentage Yield is accurate as of and is subject to change after that date. Rates may also change after the account is opened. Fees may reduce earnings. Minimum deposit to open an account is $1.00. Maximum principal deposit balance: $1,000,000. See the Disclosures for additional information and limitations. 1 Foreign ATM fees will not be assessed by FNBO Direct. If you use an ATM that is not operated by us (branded with the logo), you may be charged a fee by the operator of the machine and/or by any network used (and you may be charged a fee for a balance inquiry even if you do not complete a transaction). An ATM is considered a 'foreign ATM" if it is not branded with the logo. If we own the foreign ATM: (1) we will not charge you a foreign ATM fee for using it (2) if a surcharge applies, it will be disclosed at the ATM (currently such 'owned foreign ATM 'surcharges' do not exceed $10.00).